​January saw the launch of our Agency Staff Gratitude Program, with one hundred of our most loyal staff receiving £25 M&S vouchers as a Valentine’s Day treat. Our people are the beating heart of our organisation. They bring sunshine to cloudy days. So, we’ve committed to finding novel ways to show our appreciation, now and in the future, to those who consistently demonstrate their love of what they do - day in, day out! I mean, who doesn’t like a surprise, a treat from time to time? 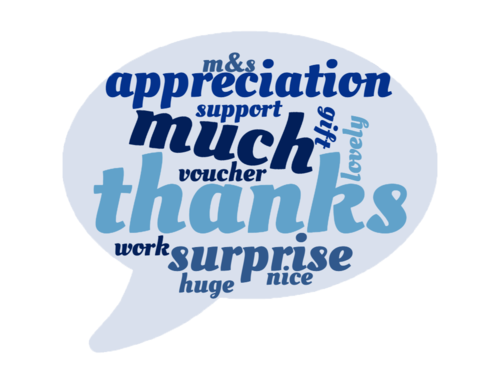 What we’ve learned is a “thank you” goes a long way - but we want to say “thanks” in new ways too! Whether it’s in the form of a bunch of flowers to mark a personal occasion or high street vouchers to recognise performance, we proudly to go the extra mile for our staff because we believe in giving back a little of what work-life takes out. The response has been overwhelming and we hope everyone will make it their aim to be part of our reward consideration next time around. So, what will you do to catch our attention? There’s no magic required, just a little application because pride in the job pays dividends!